Being Retro: A Little Devilish? Masses of people on a day called "Black Friday" converge in one central place, and the churches are not up in arms. Hell I got my $2.00 waffle maker and punched a few followers in line... will I burn? Kidding! And I hid in my house and shopped online! No you won't burn. You didn't kill them. I restrained my homicidal impulses and got a $200 dollar Blu-ray player for $50. Self control is rewarding, I guess. Hope you and your family had a great Thanksgiving. Some lady in my local area went to jail for macing the people ahead of her in line waiting for the store doors to open!! 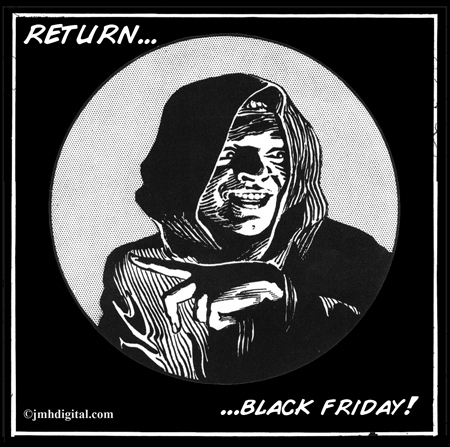 It seems Black Friday gets a little more crazy each and every year! I stayed safely tucked away in my room, no black friday shenanigans for me.